Yes, I have changed the name of this site. I have been thinking about this for a while. A lot of my writing deals with mid major basketball, the 22 conferences that compromise that fiefdom (remember the A10 is not a mid major here. It's a "Wannabe Conference", which is what I also call the Mountain West and Conference USA. More on that in a future column). A couple of news items in the "not surprising" category. Seth Curry and his 20.2 points per game scoring average are transferring from Liberty after one season. I have noted a few times on here that it was surprising he was at Liberty and not at Davidson where he could have teamed with his brother Steph and made Davidson a serious force to be reckoned with this year. I would be surprised if he ends up transferring to Davidson since a) he has to sit out a year and his brother only has a season left and b) it's not quite up to what Curry says is taking "advantage of new opportunities that may be available to me in a higher-rated conference". I am not sure Curry is quite power conference material, say Virginia Tech where his dad went to school. I might be wrong but my guess is that he ends up in the A10 perhaps on Richmond. Our second not surprising story is Anthony Grant made a second visit to the University of Alabama today. With Eric Maynor graduating and next season potentially being a struggle in the first year without him as a coach of VCU, Grant is making the most of his two NCAA Tournament appearances. Stick a fork in him, he will be shortly named coach of the Crimson Tide. The concern VCU fans should have is whether Larry Sanders will follow him to Alabama. Don't be surprised if you see that happen. A key thing to note in tonight's St Mary's - San Diego State game at 9:00 PM on ESPN2. Diamon Simpson needs to shoot better from the free throw line. He was 0 for 5 from the line Monday against Davidson and some of the shots were absolutely brutal. One of them hit the bottom front of the rim with only the top third of the basketball. It was ugly. His shooting style from the line is consistently low line drive and barely gets above the rim. Thus his shooting percentage is 59 percent. Don't be surprised if it is close tonight that the Aztecs pull a "Hack a Shaq" and foul him a lot. In the Division II Quarterfinals, #2 ranked C.W. Post takes on #1 Findlay, Ohio in the final game of the day (8:30 PM Eastern start) in Springfield Mass. You can see the video here. How the #2 ranked team takes on the #1 ranked team in the country in the quarters is beyond me. Who is doing the pairing, C.M. Newton? The Division II semifinals are tomorrow night with the championship on Saturday afternoon in Springfield, Mass. Anyway, Texas A&M was supposed to be one of the contestants. When the host announced it was Texas A&M's turn, no one ever came up. After a few seconds, the contest host then stated "I guess no one from A&M showed up." I shouted out "That's OK. They didn't show up for UConn either!" Thought you would all enjoy that. This will be a short post because I have to check out today and I have to go to the morning session of the conference before I head to home. I have been here in Philly since Sunday and its been non stop sessions during the day, then hanging out with fellow Hofstra Colleagues at night, sans my 11:30 p.m. to 1:30 a.m. trip to the hotel bar to watch Davidson - St Mary's. If anyone watched at least the first half of the game, you saw a very entertaining 20 minutes. It was like mano a mano, Patty Mills vs. Stephen Curry. There was Curry nailing that center court three from seemingly 3o plus feet to put Davidson up early 11-6. All net. Then there is Mills, who is sooo quick. That reverse layup down the lane later in the first half was just a treat. The first half ended with St Mary's up three 36-33. Davidson tied it a 36, as who else, Curry, fired a three. But then Mills came back with a layup to put St Mary's back up. The Gaels eventually pulled away in the second half as Davidson had no answer for Mills along with Omar Samhan and Diamon Simpson, the dynamic front court duo for St Mary's. St Mary's would go on to the NIT quarterfinals with a 82-68 win. It was Double Double night for the Gaels as Mills had 23 points and a career high 1o assists. Simpson had 12 points and 15 rebounds while Samhan had 18 points and 9 rebounds, as the Gaels outrebounded the Wildcats 45-36. Curry had 26 points, 9 rebounds and 5 assists. But as much as I love watching Curry and the Wildcats, there is no true second consistent scoring option for the Wildcats. Wil Archambault had 10 points and Andrew Lovedale had 9 points and 10 rebounds, but combined they shot just 7 of 20 from the field. Watching the game, I felt that the rest of the country was denied from watching these two teams play each other in the NCAA tournament. Instead, most of the country had to stay up late to see two good teams with two great players play in the NIT. On Sunday, I didn't get to see any of the games, sans the second part of the second half of the Louisville-Siena game where the Saints came back to take the lead only to lose at the end. By the way, what a team Siena has. They were down 12 early in the second half to the #1 overall seed in the tournament and came back and took a four point lead. Only Hasbrouck graduates from this Saints team, so we'll see them again next year. I didn't see Cleveland State get beat by Arizona (more on that in a second). So, there is really only one mid major left, Gonzaga. Remember, the A10 is not considered a mid major here, thus Xavier, doesn't count. If you don't like that, go talk to Linda Bruno, commissioner of the A10. It's a chalk fest Sweet 16. Outside of Arizona, who remember folks is not a cinderella because they are a power conference team, all the other teams left are #1 - #4 seeds. That's just amazing. I think you might see some upsets in the Sweet 16 round, but nothing like a #10 beating a #1 (sorry Arizona, your run ends with Louisville). No Davidson, no George Mason, no Southern Illinois or Western Kentucky. Kinda of boring in a way, no? Remember, tonight, on ESPN2 at 9:00 pm, the last mid major left in the NIT (after Creighton blew a late lead at home to Kentucky, ugh), St Mary's is at San Diego State, as again the boys at the NCAA have no clue about seeding. The #2 seed in the "West" NIT bracket Gaels beat the #1 seed Aztecs on a neutral site. Yet the Gaels are at the Aztecs. Gotta love CM Newton. Hopefully Mills, Samhan and Simpson and company escape the Gaslamp Quarter with a win and allow the MSG folks a chance to seem them in the Mecca. If they make to the Garden, I will be there! Nothing like having a major conference at work put a kabbash on trying to watch the afternoon first round NCAA games. On Thursday evening, my friends and I went over our friend Don's house, who cordially invited us to watch all the games on his Direct TV package in his home theater system, complete with five TVs, one large one in the center. The UCLA cheerleaders and the VCU kickline look great in large high def. :-) So thus it was some Mike's hard lemonade, some various snacks, a comfy chair and some good college basketball. Last night, I had an online baseball draft, so in one browser tab I was listening to Arizona wax Utah (and cursing out the fact that the Mountain West teams were so bad they were getting blown out by mediocre PAC-10 teams), then watching dribs of Cleveland State and Wake Forest, while drafting Albert Pujols and Dustin Pedroia. On the first day of action, well, there was only one major upset, and I should have seen it coming but didn't. I did say in my preview of this game "I can see the Hilltoppers winning here". Perhaps I should have trusted my vision more. #12 Western Kentucky thoroughly outplayed Illinois for 38 minutes then held onto beat Illinois 76-72 in the Portland Regional. It's the second straight year the Hilltoppers knocked off a #5 seed. Last season, Western Kentucky beat Drake in the first round of the Tampa Regional. The Hilltoppers had all five of their starters score in double figures led by Steffphon Pettigrew who had 17. Only one of those five is a senior. Damn. As for the Illini, well to paraphrase the song, "I never promised you a second round in the Rose Garden." As for near upsets, first - Maryland over Cal and Michigan over Clemson do not really count as upsets. A #10 over a #7 when it involves two power conference teams, uh no. Well as for what I would consider an upset, some teasers but no real skin. :-) During the day in the South Region, Butler was down 9-0 early to LSU. It took the Bulldogs a while but with about 14 and half minutes left in the second half, they went up 44-43 on the Tigers. They would again comeback and be ahead by one, 54-53 with eight minutes left, but it was their last lead of the game as they lost 75-71. What hurt Butler the most was 11 steals by LSU, which is very uncharacteristic of a Butler team. Matt Howard led Butler with 22 points. Around the same time in the West Region #15 Cal State Northridge put the fear of god into #2 Memphis and a lot of people with the Tigers in their brackets. For about 33 minutes, the Matadors played the game of their lives. Their lead in the second half at one time was as much as six, 62-56 with 10 minutes left. But finally the Tigers overcame the mighty bull killers with a game ending 20-6 run. In the West region, # 12 Northern Iowa felt right at home playing #5 Purdue. Despite being down 14 points early in the second half , the Panthers plodded their way back but couldn't get closer than four points, losing 61-56 to the Boilermakers in what could best be described as "Northern Iowa meets the Big Ten and You Get a MAC game" matchup. In the evening on Thursday, as I sat in my comfy chair with my Mike's Lemonade in hand and mesmerized by five TVs, I was going to see some interesting games. In the East in Philly, #3 Villanova took on #14 American. The Wildcats were expecting to handily beat the Eagles. As did I. The Eagles had other plans, specifically Garrison Carr and Derrick Mercer. As Carr and Mercer started burying shots from the outside, Villanova tried to follow suit and failed miserably. As Jay Bilas railed about the Wildcats needing to go inside, American went on its merry own way and went up 41-31 at the half. The Nova fans had to be stunned and the four of us were watching with great pleasure, even if our brackets looked like they might be going up in smoke, at the possibility of a major upset. As my friend Dr J was texting me with "We may have found this year's Curry" in Garrison Carr, the Eagles came out and scored the first four points of the second half. It was a 14 point lead now. But Villanova must have got an earful from Mr. GQ at the half and starting scoring inside on layups and foul shots. And the Wildcats started pressing. The Eagles were able to break the press but seemed content to set their offense instead of making them. As my friend Mal yelled at the screen "Points are your friend!" , the Wildcats chipped at the lead. Then the crucial decision by Jeff Jones that sealed American's fate. He sat Carr when the senior guard got his fourth foul. The Eagles offense was never the same. Nova took the lead 58-55 on a Dwayne Anderson three with less than six and a half minutes left and the Wildcats never trailed again. Carr came back in and hit a jumper to cut the lead to five 62-57 with 4:30 left, but the damage was done. Nova went on to win 80-67. Carr had 22 points and Mercer added 17 for the Eagles. Meanwhile in a battle of mid majors, you had the Zags face the Zips as Gonzaga got more than they expected from a MAC tested Akron team. Akron came out and dictated the pace. That meant MAC basketball -slow, plodding, methodical basketball with physicality. Lots of physicality. Not quite the Morgan State take down of Blake Griffin that night, but close enough. Thus, Akron was up for a good part of the game, leading 46-41 with 15:25 left. Then the Zags took over. The Zags first took the lead with a 9-3 spurt. Then Gonzaga took the lead for good with a 23-3 run which included Josh Heytvelt scoring ten of the twenty three points. The run also featured three forced turnovers on Zag forward Brett McKnight. The Zags over the Zips 77-64 as Gonzaga shot 52 percent as Heytvelt had 22 points and 8 rebounds. Then was the game near and dear to our CAA following hearts, VCU vs UCLA. Maynor vs. Collison. Sanders vs Oboya.. The Rams kickline vs. the UCLA Cheerleaders. Can I call that last one a draw and take both?! The game was really two parts. The game with Larry Sanders on the court and the game with Larry Sanders on the bench. The first half was pretty even with the Rams having a one point lead 23-22 with 5:11 left. Then Larry Sanders got his second foul and went to the bench. With Sanders on the bench, Eric Maynor had no other options for scoring. With Sanders on the bench , the Bruins had no one to contest them in the lane. UCLA went on a 13-2 run to end the half to go up 35-25. In the second half, Sanders avoided foul trouble for the most part. Thus the Rams were able to chip away on the Bruins' lead cutting it to five several times over the first ten minutes. However, VCU could not get any closer and UCLA actually extended the lead to eleven 57-46 with six and a half minutes left. The Rams did them no favors by missing six of eleven free throws during this time, including missing the front end of an one and one three times. Yet VCU came back. A 16-6 run centered around who else Eric Maynor cut the Bruins lead to one 63-62 with 1:19 left. Still up a point, the Bruins ran the clock down on their last possession, "pulling a Hofstra", but Sanders blocked Collison's shot attempt with 22 seconds left and the Rams had the ball. After a timeout, Maynor got the ball and started driving on Collison. But instead of driving to the basket for a potential "Maynor", his patented floater in the lane, he pulled back and tried a fade away jumper. It clanked off the rim and the Bruins held on for 65-64 win. Very simply put, if Sanders is not out of the game for that critical 11 point UCLA run, the Rams win. My friends Mal, Tieff and I talked about that (Dr J also texted me when Jones did that with Carr). When you have a critical game with not much leeway and Sanders is such an important player, don't you keep him in (and say to him, whatever you do, don't leave your feet and foul). With Sanders in the game, he kept UCLA from scoring in the lane with his four blocks (he altered many others) and there were no second shots with his 11 rebounds (he also had 10 points). Without him, UCLA eleven point run. That was the difference in the game. Maynor led the Rams with 21 points while all five UCLA starters were in double figures including the incredibly quick Jrue Holiday with 13 points while Josh Shipp had 16 points. Yesterday, again during the day there were very few upsets and none that involved a true mid major. Utah State had a four point lead with 3:42 left but Marquette came back for a one point win 58-57. Watching the game, the highlight for me was a missed Aggie three pointer and when Aggie center Gary Wilkinson went for the rebound, the Eagles Lazar Hayward boxed Wilkinson out by hip checking him out of bounds while the ball bounced harmlessly out of bounds. No call. Typical. North Dakota State was game but fell short in their attempt to beat Kansas. Ben Woodside singlehandely kept the Bison in the game with his 37 points on 13 of 23 from the field but too much Sherron Collins (32 points ) and Cole Aldrich (23 points, 13 rebounds) as the Bison lost to the Jayhawks 84-74. The only upset was #11 Dayton knocking off #6 West Virginia in the Midwest regional as Chris Wright had 27 points and 10 rebounds. Once the Flyers took the lead 4-3 with 18:42 left in the first half, they would never trail again. West Virginia would get it within two several times in the second half but never could take the lead. So the evening came. So far there were really only two upsets, One involving a mid major as Western Kentucky dominated Illinois. The other involving a pseudo mid major, A10 Dayton controlling West Virginia. The usually reliable Butler went down to LSU. The dangerous VCU fell just short of knocking off UCLA. The trendy picks, North Dakota State and Utah State were game but couldn't close the deal. Afew lower seed upstarts, American, Cal St Northridge and ETSU gave their opponents great scares but fell short. So the mid majors were looking at only two teams, Gonzaga and Western Kentucky moving to the Round of 32, unless Siena and Cleveland State, two teams I predicted to make the second round, could save the day (remember here at this site, the A10 is not a mid major). Save the day they did. But first there were two other evening upsets. In the West Region, Arizona's Nic Wise had a feel day driving into the lane and scorching a slow Utah team for 29 points. The still not worthy of an at large bid #12 seeded Wildcats scored 50 second half points enroute to an 84-71 in over the #5 seeded lethargic Utes. Second, #11 USC came back from a halftime deficit and double up #6 BC in the second half winning handily 72-55 in a Midwest Region game. Taj Gibson, Dwight Lewis, and DeMar DeRozan combined for 62 points and 21 rebounds for the Trojans. However a#10 over a #7 is not really much of an upset. A #5 over a #12 is. But let's get something straight. Arizona is NOT a cinderella, which i am hearing today. A cinderella is a team that doesn't supposedly belong in the next round or further rounds. Arizona is a team with a long standing power conference tradition of 25 straight years in the tournament. A cinderella is a Western Kentucky, Cleveland State or a Siena. Teams not from power conferences that are not supposed to get into the Round of 32 let alone the Sweet 16. Even Gonzaga, a long standing basketball power, is considered an interloper due to playing in the mid major West Coast Conference. So now onto the REAL upsets. First Team Lockdown, the Vikings of Cleveland State just overwhelmed perhaps the most undisciplined team that my friend Dr J and I have ever seen, the Demon Deacons of Wake Forest. It started right off the bat with Cedric Jackson and Norris Cole nailed three three pointers and it was 9-0 Vikings. Then it was 18-6, then 29-12. as Wake Forest only hit of five of their first shots while Cleveland State hit on eleven of their first 20. There were also four steals by the Vikings during that time. You could have turned off the game right there, but if you were watching it like me, did it seem to you that the crowd was real dead the entire second half? It was really eerily quiet and relatively empty. Did all the Demon Deacons fans go home atthe half? Anyway, Jackson, Cole and J'Nathan Bullock, combined for 62 points, 13 assists and 13 rebounds as Cleveland State crushed Wake Forest 84-69. Wake actually shot 52 percent from the field but Cleveland State had 15 more FG attempts as the Demon Deacons had 18 turnovers to the Vikings 6. Finally, there was Siena - Ohio State. What a way to end the night. A veteran Saints team playing a young Buckeyes team in the Buckeye's back yard, Dayton Ohio, thus a loud O-H-I-O chanting supportive crowd that Siena had to deal with. The Buckeyes got off to a quick 8-3 start but the Saints quickly tied it back at eight all. That was a common theme in the first half as Ohio State would pull ahead then Siena would come back. The lead was five at the half 28-23. However, the start of the second half was not kind to Siena. Ohio State pulled out to a 41-30 lead. But just as they did for most of the game, the Saints marched back in (cmon you knew the pun was coming). A 9-0 run cut the lead to two, 41-39 with 10:41. But as I watched the second part of the half, I wondered if Siena could come back to tie it. It took nearly eight minutes, but finally Ryan Rossiter tied the game up at 49 with 2:57 left. But then it seemed Siena let up as Ohio State scored seven of the next ten points and again the Buckeyes were up 56-52 with 55 seconds left and Ohio State with the ball at the line. Then the critical moment that Buckeye fans will be complaining about for the next nine months. B. J. Mullens missed both free throws and Siena had life. And the Saints took advantage. Kenny Hasbrouck, who struggled the entire game, buried a three to cut the lead to one, 56-55. After an Evan Turner miss, Siena had a chance to win the game, but Hasbrouck was fouled on his way to a layup that just missed being a three point play. Hasbrouck, a surprising weak free throw shooter for such a good scorer, only hit one of two free throws and tied the game. Another Ohio State miss and the game went into overtime. The Saints then took the lead for the first time since it was 3-2 by scoring the first four points to take a 60-56 lead. But Ohio State would score eight of the next ten points and the Saints again were down three with nine seconds left. But as I texted to my friend Dr J, "You can always count on someone named Moore", Ronald Moore buried a three pointer to tie the game at 65 and thus it was onto a second overtime. The second overtime was just like the first, Siena went ahead 68-65, then Ohio State tied it up on an Evan Turner three. After Moore hit one of two free throws (ok, so us Moores need work on our free throws), Turner again hit a shot to put Ohio State up 72-71. Again, staring at the end of the season in front of a hostile crowd, Siena reached down one more time. And who else do you go to? Ronald Moore. Moore buried another three with two seconds left to put the Saints up 74-72. Ohio State missed a long desperation shot and Siena moved on to the second round for the second year in a row. Just like the entire season, it was a team effort for Siena. The entire starting five scored in double digits led by Edwin Ubiles 20 points. All five Saints starters played 44 minutes or longer with Alex Franklin playing the full 50 minutes. Amazing. Hopefully they will have slept late today. They will need it facing #1 Midwest seed Louisville tomorrow. So after two days, we have four legitimate mid major teams left; Western Kentucky,Gonzaga, Cleveland State and Siena. The Hilltoppers and Zags play each other tonight, so one is guaranteed a sweet sixteen. Maybe Cleveland State and Siena will join them too. Because I will. Occasionally I read the CAAzone.com postings and as you can see, they are one of my links on the site. Often there are good points made in the postings, and often well there are bad ones. Well in the last couple of days there has been this interesting discussion on CAAZone.com. It stems from the fact that Hofstra turned down both the CBI and CIT tournaments. A letter was sent out by the Pride to Pride Club members by Director of Athletics Jack Hayes and Head Coach Tom Pecora stating that Hofstra's intention was to play in the NIT and not in the CBI and CIT. Being a Pride Club member, I got one of those. Well, this has brought out a lot of heat on the Hofstra Pride board section of CAAZone.com. A lot of people are complaining that Hofstra should have played because it would have given them good experience to "play against some Big conference teams like Stanford, Wyoming, Oregon State" as one person noted. Or, as another posting on the site noted "Since HU joined the CAA... they have no NCAA tourney appearances, ODU has two. Which team accepted a CBI bid, and which team felt too good to take one?" Or my favorite quote of all below. "It would be like a MAC school refusing to participate in a lesser bowl like the New Orleans Bowl because they expected to get in a New Year's Day bowl." Ok, let's get some things straight here. First, if you are a regular reader of this site, I am as impartial to Hofstra as one can possibly be. I have taken the team to task often for its play, and I am the author of the phrase "Pulling a Hofstra", which is a certain kind of play at the end of a close game. That being said, I feel an incredible need to defend Hofstra on its decision not to play in either the CBI or the CIT. And I have the talking points needed to prove that. 1) As I noted in a previous post, to host at least ONE game in the CBI costs $60,000. And I learned after that post, that to host at least ONE game in the CIT costs $28,000. Folks during economic times like this, it's really hard to justify paying that kind of money for the sake of playing games. More on that in a second. 2) To refute the post above, its not like a MAC school turning down a bowl game. You don't have to pay to go to a bowl game. If you are fortunate enough to be invited to a bowl game, that bowl PAYS the school money to go to a bowl game. Why do you think it has been so difficult to get a playoff system in college football?!!! Because schools GET money to go to bowl games. Here with the CIT and CBI, you have to PAY to go to postseason game. BIG DIFFERENCE! 2) I can tell you from working at Hofstra, Hofstra spent a lot of money for the October Presidential Debate, prior to the economic downturn. The Presidential Debate Commission required a lot of things for a school to host a debate and Hofstra wisely spent on that. The press Hofstra got for that debate was immeasurable. Hofstra was in the news for days, hell weeks. In fact, I can guarantee you that the CNN Anderson Cooper broadcast from outside Hofstra Hall on Thursday of this week was due mainly to Hofstra holding the debate in October. 3) What press is Hofstra really going to get by playing in the CBI and CIT right now? The NCAA tournament is going on and the NIT gets broadcasted on ESPN. What's the CBI on right now? HDNET I think. How many of you get HDNET? Seriously. 4) To be brutally honest, even if Hofstra was on the fence about hosting a game in this tournament, with the NCAA and NIT going on, how many people would attend the game? Let me put it to you another way. How many people attended the ODU vs Hofstra game at the Mack Arena on February 10 which was NATIONALLY TELEVISED ON ESPNU? The game attendance was 2241. That was a midseason conference game against one of Hofstra's most hated rivals in the CAA, always guaranteed to be a good game, and they couldn't even get the Mack Arena half full for that. What makes you think that they would get 4000 for a game midweek vs. Rider?! 5) As for the experience factor playing Stanford, Oregon State etc. Hello, half the Hofstra team is graduating. There are seven new recruits coming in the fall. It does Hofstra no good to get experience now when basically the half team leaves. The seven new players coming in need the experience, not Zygis Sestokas who will be playing back in Lithuania next season. Plus 32 games during the season is enough experience for those remaining. 6) Hofstra wasn't the only team that turned down the CBI and CIT. Cincinatti (who played in the CBI last season), UALR, Vanderbilt, Seton Hall, VMI, Miami of Ohio, Wright State, Mississippi and several others turned down both as well. 7) Finally, I will say this. A friend of mine very aptly put it. "It's games for the sake of games". You are paying sixty grand or twenty-eight grand per game for what? So that you can say you beat the leftovers of the NIT? Seriously, that money can be better spent for example on recruiting that next big player in 2010-11, or financing a preseason tournament trip to say the Charleston Classic or the Great Alaskan Shootout. Tournaments with real big conference teams in them (again the inaugural Charleston Classic had THREE out of the eight teams there make the NCAA tournament. Not bad). And finally, lay off Tom Pecora and Jack Hayes. They are not responsible for the monetary decisions at Hofstra. And Hofstra like Seton Hall, Cinci and the other universities mentioned made wise monetary decisions. Remember, they are just that, "universities". In a time of a very difficult economic situation, money can be better spent than on just "games for the sake of games." Hofstra had a nice season, 21-11. They just weren't good enough for the NIT. They have a good future with probably one of the two best returning players in the CAA coming back for two more seasons in Charles Jenkins (ODU's Gerald Lee the other). A seemingly good recruiting class. If you're a Hofstra basketball fan, appreciate the season you had and hope for a good future. The future isn't going to change because you're not in the CIT or CBI. Trust me on that. Write this down. Memorize it. Give yourself extra sleep. Next Monday night at 11:30pm eastern, it's Davidson at Saint Mary's on probably ESPN2. Curry vs Mills, Samhan and Simpson. Can't wait. I'll be in Philly at a conference but I will be up watching! As usual, I never seem to get through a full NCAA tournament predictions without cutting them short. So the predictions come rapid fire with the little preview behind each. It doesn't mean though I didn't do my research. Also to make sure to see my previous articles on Part I of my predictions plus read the story on C.W. Post entitled "A D2licious Comeback by Post". Pitt over East Tennessee State - Though I love the Bucs trifecta of Tiggs, Pegram and Smith, having first watched them at the Charleston Classic earlier in the season, Pitt's own trifecta of DeJuan Blair, Sam Young and Levance Fields will be just too much. Oklahoma State over Tennessee - It's going to be a bad day for the state of Tennessee as both the Bucs and the Vols will go down. And that's just not good. Both teams played at the Old Spice Classic. Tennessee lost to Gonzaga in the championship while the Zags sent the Cowboys off to the loser bracket in the first round. The Cowboys have won eight of their last ten while the Vols won only six of their last ten. Both teams are high scoring but the Vols simply just don't play defense. The quick exiting of the SEC teams continues. Florida State over Wisconsin - When you take a close look at Wisconsin, you can see why they were the second to last at large team in the tournament. Outside of a non conference win at Virginia Tech, no other wins to speak of. And they lost to UConn and Texas at home and at Marquette. They were once 12-3, then lost six in a row, then won four in a row, then lost three of their last five. A neutral site/road record of 6-7 is not pretty either. Meanwhile Florida State won neutral site games vs California and Western Kentucky, plus the big win over North Carolina in the ACC tournament. Not too many people know about Toney Douglas, but they will after a pasting of the Badgers. Xavier defeats Portland State - As much as I love Jeremiah Dominguez, the Musketeers BJ Raymomd, CJ Anderson and company will be too much for the Vikings. Texas over Minnesota - I would like to go on record saying that I really don't care for either team. The peripherals for each are bad. Minnesota played all their non-conference games at home sans two. One was a one point win over a bad Colorado State team. The other, the signature six point neutral site win over Louisville. Texas is 4-7 on the road this season. Their two non conference wins are a home win over UCLA and a neutral site win over Villanova. Texas went 7-7 in their last 14, Minnesota went 5-7 in its last 12. Ugh. I'll take Texas just for the sake of it. Doesn't matter, either team loses to Duke in the second round. Villanova over American - The game is in Philly. Land of the cheesesteaks and the expensive Jay Wright suits. Enough said. VCU over UCLA - Been waiting for this matchup. UCLA struggled non conference, losing to their two best opponents, Texas and Michigan. VCU has a neutral site win over off the bubble New Mexico as their best non conference win. A closer look shows UCLA lacks a strong rebounding frontcourt. Bruins meet the Rams' Larry Sanders, a shot blocking solid rebounding machine. If Sanders stays out of foul trouble and I think he will, he will cause havoc for the UCLA frontcourt. Maynor will give Collison and Shipp fits. VCU knocks off UCLA. Pitt over Oklahoma State - It's the Panthers opposing their will on the Cowboys, plus they play a lot better D.
Xavier over Florida State - Xavier has played an incredibly strong non conference schedule with neutral site wins over Memphis and Va Tech and an impressive road win over LSU. They did lose at Duke and home to Butler, no shame in either. Musketeers use that experience to their advantage against the Seminoles. Duke over Texas - The Blue Devils beat a surprisingly mediocre Longhorns team. Villanova over VCU - That wonderful Rams press doesn't work well against a guard oriented system especially when it features really good guards. Scottie Reynolds' team outplays Eric Maynor's team. Pitt bruises their way past Xavier. Blair and Young run rampant on the smaller Musketeers. Villanova downs Duke. Good guards always give Duke fits. Nova has good guards. In the Big East Tourney Redux, Pitt beats Nova. The Wildcats have no answer for the Panthers DeJuan Blair. North Carolina defeats Radford - The Heels over the Highlanders. Watch how Carolina plays if Lawson is out. May tell you how the next round or two will go. Butler defeats LSU - Simple logic. Xavier won at LSU. Butler won at Xavier. Therefore Butler beats LSU on neutral site. Also note, LSU has not won a significant non conference game on the road or neutral site. In addition to the loss at home to Xavier, LSU has lost at Texas A&M and at Utah. Those were the only two non-conference road games they had. As you know Butler also won at Davidson. Illinois defeats Western Kentucky - I can see the Hilltoppers winning here but Illinois has been sneaky good in non-conference road and neutral site games. They did lose at home to Clemson by a point but they defeated Missouri and Tulsa on neutral sites. They also won conference games at Purdue and Ohio State. Western Kentucky does have the famous "neutral site" win against Louisville at Freedom Hall. But the Illini play better D and that will be the difference. Gonzaga defeats Akron - The beginning of a long run for the well balanced underrated defensive Zags. How long? Keep reading. Oklahoma St defeats Morgan State - Blake Griffin and company too much for the Bears. The Bears do have a signature non-conference win over the Twerps, so give them credit. However, the Sooners are not the Twerps (meaning they are really good as opposed to well, mediocre) and this will be over early. Clemson defeats Michigan - I could see either team winning. Clemson did an el foldo down the stretch, like it seems every previous year. Clemson lost four of its last five including the bad second round loss to Georgia Tech in the ACC Tournament. Michigan wasn’t much better going 7-10 over its last 17 games. I like Clemson for one reason. Michigan is 0-2 in neutral or road games vs the ACC (yes they beat Duke the second time at home, but they got pasted at MSG). Clemson had a one point win over Illinois..at Illinois. Plus Michigan is young enough to be affected by the Clemson 40 minute press. Clemson moves on. Temple beats Arizona State - Dionte Christmas brings the Owls lots of presents in a win over a struggling Sun Devils Team. North Carolina barely beats Butler - Watch whether Ty Lawson plays in the first round game. If not he might be very rusty for this game and that could make a difference. Butler can win this game if Lawson is rusty or especially if he is out. If Lawson is out, all bets are off here, cause Butler can play. Most interesting matchup of the second round - Tyler Hansborough vs. Matt Howard. Looking forward to it. Also, see how Carolina matches up on Hayward and Mack on the outside. I think Carolina survives..barely. Gonzaga beats Illinois. Gonzaga is more athletic than the Illini. Matt Bouldin is the difference here. Oklahoma beats Clemson. Oklahoma’s guards are good enough to beat the Clemson press. Look for lots of easy Blake Griffin scores. Temple over Syracuse. Christmas Time comes to the Sweet 16. Gonzaga beats North Carolina - Yes you read it correctly. Gonzaga has the athletes and the depth to play with Carolina. The difference is Gonzaga plays defense. Carolina doesn’t. The Zags always solid non-conference schedule becomes important here. They had UConn beat at home if AJ Price doesn’t hit that miracle three. And that’s with a full UConn team with Jerome Dyson that the Zags hung with. Key matchup - Josh Heytvelt vs. Hansborough. I think Heytvelt comes to play here. Oklahoma defeats Temple - The Christmas Season ends in the Sweet 16. Blake Griffin is just too much for the Owls. Oklahoma defeats Gonzaga - This is where Blake Griffin puts the Sooners on his back and brings them to the Final Four. I was in Brookville New York last night as #1 seed C.W. 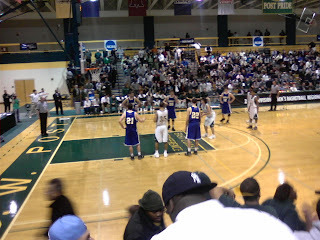 Post took on #2 seed Bentley for the championship of the Division II Eastern Regional. Post had beaten Philadelphia University and Assumption in their first two games. Bentley defeated Bridgeport then Merrimack in double overtime to reach the final. At the start of the game, Bentley looked like they were going to shoot Post out of their own gym as they went out to a 12-2 lead on the strength of two three pointers. The Pioneers would whittle the lead down to 23-17 as Post drove inside for layups, their strong suit. But Mike Quinn and Jason Westrol buried a couple of threes and a John Brandt layup made the game 31-17. Post would only cut the lead by one entering the half as they trailed 37-24. Figuring Post would need to cut into the lead immediately to make it a game, Bentley came out and scored five quick points on a Westrol three and a Brian Tracey layup to give the Falcons their biggest lead 42-24. The Pioneers were looking at an 18 point second half deficit and the possibility that their magical undefeated season would end on their home court. The gym was relatively quiet and the crowd pensive, worried that they might be seeing the end. Bentley had hit 15 of their first 27 shots and were 9 of 14 from beyond the arc. Post was only shooting 30 percent from the field (9 of 30) which included being 2 of 13 from beyond the arc. Things didn't look good for the Pioneers. But staring at the biggest adversity they faced all season, Coach Tim Cluess's team didn't waver. They roared back into the game. It started with a Kevin Burkes three. Then Nick Carter and Burkes trading baskets back and forth. Meanwhile the Post D started forcing several Falcons' turnovers. Carter and Burkes continued to hit shots. Once what was an 18 point Bentley lead was now only five, 50-45 with 13:05 left. Then came what I thought was the critical point in the game. Earlier on in the second half, there was a play where one of the Bentley players turned turned the ball over. Well the Falcons Lew Finnegan went over to the ref to dispute the call, got very upset and kind of showed up the ref. This was right by where we were sitting. Sitting next to me was my good friend Dr. J, as I call him. Well the usually quiet Dr J started yelling at the ref very loudly that "21" was showing him up and that the ref was a disappointment for allowing that to happen. It was certainly quiet enough for the ref to hear him. There was a purpose to this. Well, you had the setup. Here's where it gets spiked home. There was a loose ball and the Pioneers' Roberto Macklin got the ball and called timeout. During the scrum as Macklin called timeout, Finnegan pushed Macklin. The ref that got showed up by Finnegan called a technical foul on him for unsportsmanlike conduct . Four free throws later and the lead was cut to one. Finnegan who had nine points at the time was taken out of the game. As he headed to the bench he was still visibly upset. His coaches tried to calm him down. But you could see he was mentally done. Later on in the game, Finnegan pushed over a chair during a timeout. Finnegan did not score the rest of the game after the technical foul. Give an assist to Dr J. The place, which you can see above was quite full, was now rocking. 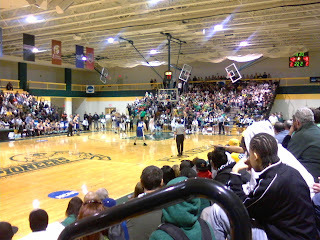 Loudest I have heard a gym since Hofstra beat Mason in Mack Arena back in February 2006. The game now stood at 50-49 Bentley with 12:42 left. Post would take their first lead of the game at 53-52 with 11:37 left on a layup by Macklin, who is one hell of a leaper. He finished several alley oop passes on the night. It was clearly evident by this time that Post decided to play its five guard lineup and wore down Bentley with their athleticism in the second half. The Falcons could not stop the dribble drive penetration of the Pioneers which resulted in many easy layups for Post. Bentley and Post would go back and forth for the next seven minutes with both teams taking the lead back. Jason Westrol would hit a three for Bentley to tie the game at 66 with 4:27 left. Post would take the lead for good on a jumper by eventual Tournament MVP Nick Carter 68-66 with 4:07 left. Layups from Macklin and Carter put Post up six, 72-66 with 1:44 left. Bentley would get as close as two, 75-73, but Post would score six straight points on free throws and that was the ball game. Needless to say the loud jubilant fans from Post, stormed the court. Burkes scored all 23 of his points in the second half as Post scored 58 second half points to storm back and win. Tournament MVP Carter added 21, while Schmidt, the all time leading scorer in Post history added 12 and Macklin had 11. For Bentley, Jason Westrol was unreal. He led all scorers with 28 points on 10 of 16 shooting, including 7 of 8 from beyond the arc. His corner three was unstoppable. Brian Tracey had 19 and Mike Quinn added 14 for the Falcons who were held to 5 of 14 shooting from three in the second half. Can't say this enough. The place really started rocking when Post made their 25-8 run in the second half. This is what I have been saying about live college basketball. There is nothing better than a packed gym/arena with an important game on the line. Like I said, I hadn't heard an gym this loud since Hofstra beat Mason (though Davidson coming back against Georgetown in Raleigh was pretty close). To be there with my friends Bob Sugar and Dr. J made it even more special. Again, there is nothing like LIVE tournament college basketball. Simply the best! Post now will play in the Elite Eight starting on March 25. Best of luck to the Pioneers. There Are Too Many Tournaments But Experience College Basketball LIVE! If you are looking for these games in your NIT bracket, look no further. Only if you are a fan of these schools and perhaps a knucklehead like me, would you know that these are the first round games for the second annual College Basketball Invitational or the CBI. Now the CBI is an interesting duck, I will admit that. From what I understand, you need $60,000 to host a first round CBI game. Eek. During economic times like this, that's kind of hard. Second, take a look up above at the teams in this tournament. Notice a few things? Like Oregon State and St John's, two teams with losing records. Here's the CBI's wording on that. The 16-team field consists of teams that are not selected for the NCAA Tournament. Teams will be invited based upon their performance during their conference and non-conference schedule, as well as how well the team is playing at the end of the regular season. I guess St John's and Oregon State were playing well at the end of the season...Riiiight. So in other words, if you are willing to pony up, you can play. Not a good message to send. Now again you won't find these teams in your NCAA bracket. These teams are the founding 16 teams of the first annual CollegeInsider.Com Postseason Tournament. They even have an established selection committee. Their format is respectable and commendable unlike the CBI's where cash and potential draw rules supreme. Teams selected must have winning records. I don't know if there are significant fees involved but at least CollegeInsider.Com is a respectable college basketball web site. And as you can see, their teams are definitely better as a whole than the CBI's. My point is this though. It's perhaps way too much. I can understand teams want to keep playing, especially Kent State wants to keep alive their 20 win consecutive streak. But outside of their fans, is anyone going to watch on TV? Most likely not. Thanks to the NCAA Selection Committee, there are a lot of good teams in the NIT this year. Do you think anyone is going to watch one of these games over a potential St Mary's - Davidson in the second round? Or especially since there is that little matter known as THE NCAA TOURNAMENT. It's just too much. But if it draws fans to watch live games, great. See below for what I mean. Now for something completely different. If you live on Long Island, like me, come out with me to the Division II Regional Final at C.W. Post tonight at 7 p.m.when the #1 seeded Pioneers take on #2 seed Bentley for the right to go on to the Division II Elite Eight. Celebrate the green with the green trim of the Pioneers. I was there for their first round dismantling of Philadelphia University and the place was rocking. Remember, college basketball should be experienced live. For me, it's never been just about writing about games on TV. I have been up and down the East Coast from Providence to Charleston to watch college basketball. I've been at Storrs, Connecticut to see the LIU Lady Blackbirds face the #1 seed UConn Huskies. Been to Raleigh to see Stephen Curry's coming out weekend party in front of a national audience. I have been fortunate to watch a rising Division III program in St Joseph's and get to interview a great coach, John Mateyko, a Jim Larranaga disciple. He turned a team that when he started had several guys who never played high school basketball into a developing DIII power. Been to many preseason and postseason NIT games at the Garden, including this season when Blake Griffin left the fans going OOOOOOH vs. UAB. You don't get that sitting on a couch and writing about basketball on TV, as Kyle Whelliston would say. I tell people every chance I get to go experience college basketball live. Go to a postseason tournament, go to a preseason tournament. Take a road trip. Its not just about the game, its about the experiences too. If you get one chance the remainder of this season, see it live! The key things to look at are this. 1) The teams that have the best Top 50 RPI records tend to be the best teams in the tourney. 3) Look at how teams are on the road and neutral site. Louisville beats Morehead State. Nothing more needs to be said. Siena defeats Ohio State. As I started writing Part I of this preview, the Moody Blues "Steppin in a Slide Zone" was playing on Youtube (yes I am a HUGE Moody Blues fan). That's a relatively young Ohio State team going up against a veteran NCAA proven Saints team. Kenny Hasbrouck, Edwin Ubiles and friends are not a good matchup for the Buckeyes. 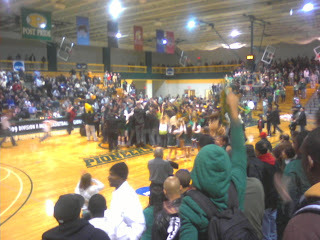 Siena moves on. Utah defeats Arizona. The Utes remind the committee that for the second year in a row, the Home Court Hero Wildcats had no business being in the NCAA Tournament (and after watching Patty Mills put up 17 of his 27 points in the first half against Washington State in the NIT, it burns even more). Utah has been one of the steadiest under the radar teams this season. They played a very solid non-conference schedule with a non-conference SOS of 10, including several PAC-10 teams and Gonzaga. The Wildcats frontcourt will be shrimp on the barbie for the Utes Australian Luke Nevil, a seven foot two force on the inside. By the way, the Utes are 5-0 on neutral sites. Cleveland State defeats Wake Forest. A young undisciplined Demon Deacons team takes on Team Lockdown, an experienced group led by J'Nathan Bullock and Cedric Jackson, a team that has played some good competition during the season. Jeff Teague doesn't see too many defenses like this in the ACC. Remember, the Vikings beat Syracuse in the Carrier Dome and beat Butler at Hinkle Fieldhouse. They know what's it like to be on the road. Our first upset here. Michigan State downs Robert Morris. The first of several wins for the Spartans, the team with the best record vs Top 50 RPI teams in the whole tournament. Boston College defeats USC. What often happens is when a team like USC, with no hope for an at large bid, makes a run and wins their conference tournament, there is a letdown. Yes, the three wins over Cal, UCLA and ASU in the tourney were impressive. However, considering USC's only decent non-conference win was a four point win over North Dakota State (warning you now Kansas, you have a difficult first round game), not a good sign when facing Tyrese Rice and the always battle tested Eagles. Al Skinner's group marches on. Kansas defeats North Dakota St...barely. This is the gauntlet bracket for the Jayhawks. The Bison are really experienced and really good. Not a good first test for a young Jayhawks team. Wouldn't be surprised by an upset but I think Sharron Collins gets them through ..barely. West Virginia defeats Dayton. The Flyers limped at the end and were one of the last three at large teams in the NCAA tournament. They unfortunately face an emerging force in West Virginia who looked really impressive in beating Notre Dame and Pittsburgh before losing to the Cuse in OT. Da'Sean Butler and Alex Ruoff are a dynamic duo. Louisville beats Siena. This will be a great game. I think Louisville's size with Earl Clark and Terrance Williams will be too much for the Saints at the end. It's close but the Cardinals move on. Utah defeats Cleveland State. The Utes' size will be too much for the Vikings. Michigan State defeats Boston College. Two physical teams. This is a scare game for me because Michigan State is 0-2 vs. ACC teams (Maryland and North Carolina). But I think Boston College struggles on road/neutral sites, going 7-7 on the season. Since I gave them the win in the first round, that means they should lose this one to a team that is 13-3 against the RPI Top 50, an impressive record. Kansas defeats West Virginia. Originally I had the Mountaineers winning over the Jayhawks but in a battle of two teams that are pretty young, take the team that has a better winning record against Top 50 RPI teams. West Virginia is 2-7. Kansas is 6-3. Enough said. Louisville defeats Utah. It will be interesting to see how Williams and Clark deal with Nevil. But the Cardinals defense will be too much for the Utes. Michigan State defeats Kansas. The Spartans won at home over the Jayhawks 75-63. Nothing here changes my thought on this. Spartans win again. Louisville defeats Michigan State. This is going to be a very good game. I could see either team winning. Two of the best defenses in the country. Both road/neutral site warriors. Cards are 12-3. Spartans 14-4. The Cardinals are 7-1 vs. the RPI Top 25. Spartans 13-3 vs RPI Top 50. I think Louisville is a little more athletic and that will be the difference. BYU over Texas A&M. A&M is one of the trendy teams people take because they have won eight of their last twelve. A deeper look though shows some flaws. A somewhat weak non-conference SOS of 145 for a Big 12 team and a 7-7 road and neutral site record. In fact if you take a look at their non-conference record, what is A&M's best win. Well they lost to Tulsa at home, that doesn't help. Give up? It's an eight point win at Alabama. In fact in non conference, A&M only had TWO of their fifteen non-conference games on the road or neutral site. UGH!. BYU on the other hand as a neutral site win vs. Utah State AND a road win over TULSA, a team A&M lost at home too. Enough for me. Cougars move on. Purdue over Northern Iowa. First, I really like Purdue, a nice under the radar team until they won the Big Ten Tournament. Big fan of Robbie Hummel and Eitan Moore, both of whom I saw at the Preseason NIT at the MSG. The peripherals aren't the best. A non-conference SOS of 191 and 2-5 record vs. Top 25 RPI. The road/neutral site is an ok 9-6. What I like about them is they play TERRIFIC defense. Only allow 59 points per game and they absolutely shut down Stephen Curry in their game won by Purdue 76-58. Curry was 5 of 26 from the field for 13 points in that game. They also shut down Tyrese Rice at the preseason NIT game that I saw at the Garden. Rice was only 4 of 12 from the field in the Boilermakers win. Northern Iowa has had a nice season and have played well on the road/neutral site going 12-6. But they struggled in non-conference games with their only solid win a neutral site win over Auburn. They got smoked by both Marquette losing by 30 and to Siena, in a game that was nowhere near as close as the final score. The Boilermakers clamp down on the Panthers and move on. Washington over Mississippi State. The Huskies had a very solid season winning the PAC-10 regular season championship. Washington played a very strong non conference schedule as shown by their non-conference SOS of 23 with a win over Oklahoma State being their best win. Mississippi State on the other hand had a non-conference SOS of 173 and really struggled non-conference. They only had four non-conference road or neutral site games and were 1-3 with their best win a five point win at St Bonaventure (the only A10 team to lose to the horrible Fordham Rams this season). Not good. If that wasn't enough evidence, South Carolina losing at home to Davidson last night in the first round of the NIT should show you how bad the SEC is. In a battle of the dogs, the Huskies easily down the Bulldogs. Memphis clamps down and clocks Cal St. Northridge. Maryland over California. Cal has struggled down the stretch losing four of their last six including a quick first round exit by USC. The Golden Bears also struggle on road/neutral sites with a 6-8 record. Maryland had lost three of five prior to their two wins in the ACC Tournament which saved them from being out of the tournament. The peripherals are pretty close. But I am going to take the human stat machine Greivis Vasquez (17 ppg, 5 rebounds per game, 5 assists per game) and the Twerps 4-3 neutral site record over Cal's 0-2 neutral site record. Missouri rolls over the big red of Cornell. Utah State over Marquette. This is the second upset I see in the tourney. Marquette is first without Dominic James and it showed as they went 5-7 down the stretch. Second, the Golden Eagles struggle on the road and neutral site, only going 8-7. Their non-conference SOS is a bad 141 and it shows as their best neutral site win is a win over Northern Iowa. They lost to both Dayton and Tennessee on neutral sites. Utah State has a very solid neutral and road site record of 13-5. Plus they way they handle the ball and their offensive style is perfect for a game like this. Plus here's a key stat, Marquette is 2-7 against the RPI Top 25. Utah State RPI...23. Uh oh. This is a game where you need all the good ball handling you can get and not having James will really hurt here. Aggies upset Golden Eagles. Purdue beats Washington - Washington had a problem beating good non-conference teams. Their best win was over Oklahoma State at home. They lost all their other games. Good enough for me. Memphis beats Maryland - The Tigers clamp down on a turnover prone Twerps team. Utah State beats Missouri - Our first mid major makes the Sweet 16. Aggies game again matches up well with Missouri. Purdue beats UConn - Yup, the first #1 seed to go down. The loss of Jerome Dyson hurts here. Memphis beats Purdue - Tigers are a little more athletic than the Boilermakers. That makes the difference here. Here are some post mortem thoughts from Selection Sunday. I know Kyle Whelliston keeps saying that this isn't a down year for Mid Major teams, but I am sorry, the numbers say otherwise. Last year, if you want to include the A10 (I don't want to but let's say so this one time for arguments sake), you had five at large bids from Mid Major conferences. There was St Joseph's, Xavier from the A10, Gonzaga and St Mary's from the WCC and South Alabama from the Sun Belt. This year there were three bids; Xavier, Dayton and Butler. If you take away the A10, there was one mid major at large bid. Butler. Now grant you, a lot of this has to do with the committee and the shameful inclusion of Arizona over St Mary's. And you can also say that there were a lot of power conference upsets that knocked Creighton out of consideration at the end. But the fact is this. The Mid Major conferences as a whole aren't as good as the last three years. The Missouri Valley has been down the last two years. One bid each season. Illinois State played a cupcake non conference schedule and killed themselves from any consideration. Creighton's three best non conference wins (Dayton, New Mexico and George Mason) were all at home and losing by 24 points in the semis to the aforementioned cupcake killers is just bad. At least when St Mary's lost by 25 points, it was to the #12 team in the nation in the conference final. The Sun Belt had a down year. Western Kentucky had a big win over Louisville but they won their tournament. UALR had a nice year but they didn't even get a NIT bid due in large part to that stinker in the semi vs. South Alabama. The West Coast Conference suffered from the injury to Patty Mills and from the early season ending injury to San Diego's Brandon Johnson. The Colonial was down for the second straight season. VCU showed they were the best team during the conference tournament and they had the best non conference win of the whole league, a neutral site win over NIT bound New Mexico. George Mason had no non conference wins to speak of unlike last year. Davidson just wasn't the same team without a second scorer like Jason Richards and the result was a NIT berth. Every time I think of Seth Curry passing up Davidson for being his own man at Liberty, I want to scream. Great, no one really knows Liberty and big brother Steph's Wildcats are bound for the NIT. Had Seth gone to Davidson, I tell you from seeing him play, the Wildcats are in the dance and could do some serious damage. Sorry, that's how I feel. Yes, there is a good showing of mid majors in the NIT. By my count, twelve are in the NIT (this includes two A10 teams - Duquesne and Rhode Island - last A10 mid major reference ever from me), but some were automatic bids for either finishing first or second in conference. But for all this talk about that we need to have mid majors make the Sweet 16 on a regular basis, that's fine. But you need opportunities to do so. And when you are only getting the automatic bids plus one (back to saying A10 is not a mid major for my argument here), the much less chances you have for getting teams into the Sweet 16. Simply put, a lot of mid majors like Illinois St, Creighton, George Mason among others need to be in preseason tournaments every year. Get into the Great Alaska Shootout, or the San Juan Shootout or the 76 Classic like St Mary's or even the Charleston Classic, which featured three NCAA teams (East Tennessee State, Clemson and Temple and nearly a fourth, Charleston). Strengthening the road/neutral non conference schedule is the only way these teams can improve their resumes and force these clowns at the NCAA Selection Committee to take them more seriously. Yes, there is the possibility you get screwed like St Mary's but at least you will be much more part of the conversation come the last day. And it will be unlikely we'll see a year like this where so many power conferences had upsets. Well, I hope. Despite my thoughts on an overall down power year for NCAA mid major bids, there is hope. There are some games that I think mid majors can do really well in. 1) Siena as a #9 seed in the Midwest is due credit to the Saints strength of schedule in non conference games this season. And it's going to pay off. I think they have a perfect foil in #8 Ohio State. I definitely see a win there. 2) Cleveland State as #13 has got a really good opponent for their style..the undisciplined #4 Wake Forest. I can see Norris Cole and company shutting down the Demon Deacons. 3) North Carolina is in for it. Guaranteed they will play #9 Butler in the second round, cause Butler is good and LSU is one of three mediocre SEC teams that will lose in the first round of the tournament. Then if Carolina beats butler, they have Gonzaga. 4) Gonzaga should come out of their bracket just fine and that should be a dandy of a Sweet 16 game vs. Carolina. 6) As my friend Dr. J would tell you, North Dakota State is going to give Kansas fits. 7) Finally, Utah State - Marquette might be the best first round game we'll see. Back to speaking of the clowns at the NCAA, nice to see a lot of mid major teams in the NIT and kudos for giving Creighton a #1 seed. But give CM Newton and friends credit. They know how to tweak mid major fans. In the NIT West Bracket (I guess that's what it is), they made San Diego State the #1 seed and Saint Mary's the #2 seed. Cmon, even CM Newton had to know St Mary's beat San Diego State head to head this season. And to tweak the mid major fans even more, if St Mary's wins and Davidson knocks off South Carolina (of course it's at South Carolina), guess what we see in the second round. Steph Curry meet Patty Mills and the best frontcourt duo in the majors, the rebounding and scoring law firm of Simpson and Samhan. One last thing. If the NCAA had the kahones to do it, there would be an easy way to solve the at large bid process. This is something I am pretty sure I have noted before too. To be considered for an at large berth, you must have an above .500 conference record during the regular season. Of course, below .500 conference teams can make the tournament by winning the conference tournament, but this way it makes teams EARN their way into the dance and doesn't reward mediocrity. If you had this policy in place, the following teams wouldn't even had been under consideration; Maryland, Arizona, Minnesota and Michigan. There are a lot of angry Penn State fans tonight who would have been probably appeased had this rule been in effect. Chances are Penn State, 10-8 in the Big Ten would be in the dance as a result. A friend of mine who went to Maryland tried to defend them by saying "well we weren't 7-9 in a crappy conference." Um, when you are 7-9 in conference, it doesn't matter what conference you're in. You're mediocre. Besides, if it wasn't for the two wins in the ACC tourney, Maryland wouldn't be in. Trust me on that (also the home loss against Morgan State wasn't good either). Message to the NCAA. Stop rewarding mediocrity. Stop giving .500 conference teams at large bids that go 2-9 on the road (with the two wins over the worst two teams in the PAC-10) because they won big home games and have a 25 year reputation (Yes Mo Goldman that was a direct shot at Arizona). As a result you will have an even better tournament. Isn't that the idea?! When the Midwest bracket was announced and I saw Arizona in as a #12 seed and Dayton as a #11, I had a bad feeling. When I saw the West Bracket and saw Maryland as a #10, Northern Iowas as a #12 seed and Mississippi State as a #13 seed, it got worse. And I knew, once Wisconsin was announced as a #12 seed in the East and they went through the bracket without Gonzaga, it was done. St Mary's was being left out of the tournament. Here's what I think happened. The genius committee had St Mary's in as their last team going into today. The committee had their bracket set out with St Mary's in the West to face Purdue in the #5-#12 game. When Mississippi State knocked off Tennessee (by the way, early prediction, all three SEC teams will lose in the first round), the committee moved Northern Iowa up to the #12 seed and put Mississippi State as a #13 seed. Unfreakinbelievable. A team that couldn't get out of its own conference quarterfinals with a 2-9 road record, 5-10 road/neutral overall with a RPI of 62 gets in over a team that played most of its non conference games on the road, a 13-5 road/neutral site record (8-3 on the road) and has a RPI of 48. I thought road/neutral site record meant something. Apparently not. I was right about one thing. Earlier I said, don't be surprised that Dayton was one of the final teams to be considered in or out. The final three teams in were Arizona (#12 seed), Wisconsin (#12 seed) and Dayton (#11 seed). Wisconsin was a little bit of a surprise, Dayton was not. Still, the worst offense, Arizona over St Mary's. It's two years in a row that Zona didn't deserve to get in. Last season Arizona got in over Arizona State despite the Sun Devils sweeping the season series from the Wildcats. Somewhere, some Arizona donor has pictures on Miles Brand. Its the only explanation I can think of for the past two years. Since Tennessee couldn't hit the side of a barn, a shot, or most importantly, a free throw at the end of the game, Mississippi State wins the SEC Championship 64-61, taking another bubble spot away. The Vols had a chance to tie with 11 seconds left down 62-61 but missed the second of two free throws. The Vols got the ball back after the Bulldogs couldn't corral the rebound. Then both teams managed to not be able to inbound the ball three consecutive times with the Bulldogs stealing the second Vols inbound attempts and then hit two free throws to ice it. The Volunteers shot an ugly 29 percent from the field on the game. As a result another bubble spot is gone. Precariously on the edge are most likely St Mary's, Creighton, Maryland and I think a surprise fourth team. My guess is that based on non-conference road wins, St Mary's eeks out Creighton and the Gaels dance and the Bluejays don't. Hopefully I am wrong and both teams make it, but that's my guess at the moment. An interesting development is that don't be surprised if Dayton is that surprise fourth team being considered as one of the last final ins or outs. The Flyers do have a marquee neutral site win over Marquette but that's it as far as signature non-conference wins. They have a road loss at Creighton which may come back to haunt them, their road/neutral site record is 8-7, their non-conference SOS is 120, they have lost four of their last seven ball games and are 7-5 in their last 12 games. I am taking a nap. I need it before Selection Sunday. So if you are Creighton and St Mary's. This is it. Selection Sunday. For Creighton, it's been eight agonizing days since their loss to Illinois State in the Valley Semifinals. For St Mary's, they broke up their six day tension of losing to Gonzaga in the finals of the WCC by crushing Eastern Washington Friday. It was a last minute scheduled game that the Gaels were able to setup since they had played less than 30 regular season games (as did Eastern Washington). Both teams have had to watch at large bubble spots burst as the week progressed. First, Cleveland State stunned Butler on the Bulldogs home Hinkle Fieldhouse court to get the auto bid for the Horizon. Then the Friday 13th evening version of March Madness caused major aggravation for both Creighton and St Mary's. First, another guaranteed spot was taken as both Temple and Duquesne, two teams with very little chance at an large, won their A10 semifinal games over two big dance locks, Xavier and Dayton (the Owls won the A10 championship yesterday knocking off the Dukes). Then the Gaels and Bluejays watched as Maryland resurrected themselves with two wins in the ACC tournament, including a big win over #9 Wake Forest in the quarters. San Diego State caused further havoc by upsetting BYU, complicating matters even further. Finally, Saturday brought more pain as USC, another team with no chance for an at large bid, came back from a 15 point halftime deficit to defeat Arizona State to win the PAC-10 automatic bid. Missouri, Memphis, and Utah State won the Big 12, Conference USA and WAC automatic bids respectively, so no bubble spots were claimed there. However, there is one last obstacle in today's SEC Championship as Mississippi State, a team with no chance for an at large bid can claim an automatic bid with a win over Tennessee, a lock for the tournament. The question is whether one or both teams warrant a final at large bid spot. Based on Joe Lunardi's Bracketology, St Mary's and Creighton are battling Maryland, Arizona, San Diego State and Penn State for the three final spots. If that's accurate, then the Selection Committee will be reviewing all the material pertaining to the seven teams. So, since the NCAA Tournament Selection Committee is kind of like the Supreme Court of the Tournament, judging the fates of at large bubble teams, I would like to submit an appeal on behalf of both St Mary's and Creighton. As the representative of St Mary's and Creighton, I humbly submit that both teams should be given an at large spot in the Field of 65 for the NCAA Tournament. I offer the following evidence on behalf of both teams. are worthy of induction to the tournament because they have NOT violated most if not all those procedural guidelines. Now, I will make a case for each of the teams I represent. First your honors, St Mary's, RPI 47, has been a team exemplary of the requirements your committee wants when looking for an at large team. First the Gaels have a very good non conference SOS of 87. Second, they have neutral site wins over San Diego State and Providence fellow bubble teams. Third they have an impressive home win over Utah State, a 30 win team that has made the NCAA tournament by winning the WAC conference. The win over Utah State occurred without the services of one Patrick Mills, whose injury we will discuss later in my brief. Fourth, the Gaels have one of the best road/neutral records in the country at 13-5. In fact, nine of the thirteen non conference games the Gaels had were either road or neutral games. In those games, St Mary's was an impressive 8-1, including the aforementioned wins over Providence and San Diego State. As you are well aware from my primer, the Gaels' neutral site win over the Aztecs should be a major determining factor in deciding between these two bubble teams. I also want to note that three games in particular, road wins over Oregon, Southern Illinois and Kent State, were games over teams that last season made the either made the NCAA Tournament (Oregon and Kent State) or the NIT (Southern Illinois). The games with Oregon and Southern Illinois, two teams with a recent history of continued success in making the NCAA tournament, were scheduled in advance. As I am sure you know, the Salukis made the dance six seasons in a row before making the NIT last season. Oregon had made the NCAA tournament the two seasons prior to this one. I know these are facts/evidence that your committee particularly looks at during selection of a team worthy for the big dance. Now yes, I have to respect the evidence against St Mary's. First, the Gaels overall SOS is 154. Second, St Mary's did struggle down the stretch, going 7-5 over their last 12 games. Third, yes St Mary's lost all three games to Gonzaga, including the embarrassing 83-58 defeat in the WCC Conference Championship. However, I have rebuttals for all that evidence submitted. First, the overall SOS is low because the Gaels play in the West Coast Conference. However, the figure that the committee should find more important is that Non Conference SOS of 87. Second, yes, the Gaels did struggle down the stretch. However, that was due to the loss of one Patrick Mills, the star guard for the Gaels and the only player in the NCAA who played and actually started in the most recent Olympics. Before Mills was injured, St Mary's was ranked in the Top 25 with a 18-1 record. Also, as noted previously, my client won their important Bracketbuster game over Utah State without Mr. Mills. Also, during that 7-5 stretch, none of the non Gonzaga losses came at home. In fact one of the teams my client lost to, Portland, defeated Washington, the regular season PAC-10 champion, earlier in the season. Finally, there is the matter of the 25 point loss to Gonzaga. Yes, that was a bad loss. However, that loss came in the West Coast Conference final to the #12 team in the country in Mr. Mills second game back from his broken hand injury. But before Mr. Mills was injured at the end of the first half during the first game at Gonzaga, the Gaels had a 39-33 lead over the Bulldogs. I submit to you that the Gaels with a fully healthy mid season Patrick Mills is a worthy opponent for the Bulldogs. Furthermore, the Gaels are not the only bubble team under consideration that has lost by Gonzaga by twenty or more points. Maryland lost to Gonzaga 81-59 earlier in the season in the Old Spice Classic. Therefore I submit to you that the 25 point loss be a minimal consideration in considering the fate of St Mary's. Having made the case for St Mary's, I now submit evidence for Creighton's submission into the NCAA Tournament. Creighton, RPI 41 has also been an exemplary team worthy of entrance to the NCAA Tournament. The Bluejays were 26-7 overall and 14-4 in the Missouri Valley, the strongest mid major conference in the country (as your honors know, I do not consider the A10 a mid major conference). The Bluejays have a RPI of 41 and a very good road/neutral record of 11-5, two factors your committee seriously consider. Yes, I know that there is evidence against Creighton's submission to the NCAA Tournament. Both of the wins over Dayton and New Mexico were home wins. Second, the non conference SOS of 141 is not terrific. Finally, the twenty four point loss in the semifinals to Illinois State does not leave a good impression with such a distinguished body as yours. However, I submit to you that the Bluejays schedule, which includes the wins over Dayton and New Mexico, are more worthy of consideration than the non conference schedules of fellow bubble teams Penn State and San Diego State, neither of which have a signature non conference win over any team of note in the NCAA tournament or of bubble consideration. Also, unlike Arizona or Maryland, Creighton had an excellent conference record of 14-4, which tied them for first in the MVC with Northern Iowa. Arizona was .500 in the PAC-10 and Maryland was 7-9 in the ACC, both violations of the Moore Selection Primer. Now that I have humbly submitted my case for St Mary's and Creighton, I must now make the case against each Maryland, Penn State, Arizona and San Diego State, as their consideration adversely affects my clients. Penn State is perhaps the easiest to make a case against. Despite their 10-8 Big Ten conference record, the Nittany Lions have a RPI of 68, the worst of any the six teams considered for the last three at large spots. They also have the worst non-conference SOS at a truly awful 314. They have no significant non-conference wins of note as compared to fellow Big 10 Ten bubble teams Minnesota (Louisville) or Michigan (Duke, UCLA). And finally, they lost in their conference quarterfinals to Purdue by 14, having been down for a good part of the game by 20 plus points. San Diego State is the next easiest to make a case against. Though the Aztecs have a very respectable RPI of 31 and a non conferences SOS of 92, they have no significant non conference wins of note. Second, their RPI vs top 5o RPI teams is a poor 2-5 with both wins being over fellow conference teams BYU and Utah. They do have three wins over UNLV and a win over New Mexico, two former bubble teams. However, the last key piece of evidence in ruling out San Diego State is that they have a neutral site loss to my client St Mary's (as well as a road loss to Arizona, who I will get to in a second). As for Arizona, another strong case can be made. First, Arizona have a second worst RPI among the bubble teams considered at 63. The Wildcats have a truly absymal 2-9 record, a major violation of the Moore Selection Primer and a category your humble committee looks at very closely. All their significant conference and non conference wins were at home. Also, the Wildcats lost in the quarterfinals to Arizona State by double digits. A strong case can be made against Maryland, RPI 51. The Terrapins were 7-9 in conference this season, a major violation of the Moore Selection Primer. Maryland's non conference SOS of 128 is lower than St Mary's. Their road record is a weak 2-6. And until they won their last two games in the ACC tournament, they were 5-7 in their last 12 games. They do have a signature neutral site win over Michigan State and did manage to make the semifinals of their ACC tournament but the other factors should outweigh that when choosing among St Mary's and Creighton. So there you go your honors, thee is enough evidence to support my claim that both St Mary's and Creighton deserve to be in the NCAA Tournament over other teams such as San Diego State, Maryland, Arizona and Penn State. Please carefully consider the evidence before rendering your decision at 6:3o pm this evening. Hey what did you expect from someone that works at a law school. I may not have a law degree and my background is IT, but I have learned a few things from osmosis. Enjoy the day and root for Tennessee to win the SEC championship. Then hope tonight the committee follows the evidence. Its elementary, Watson. Other Conferences Starting Tonight Too!